The global demand for oil and gas has touched new heights. Companies all over the world are leveraging their capabilities to process oil and fulfill the world's current needs. Therefore, when it comes to extraction, picking the right oil and gas equipment is a major decision for effective operations in the field. It is essential that the equipment is built to withstand every situation and adapt in the changing environment. 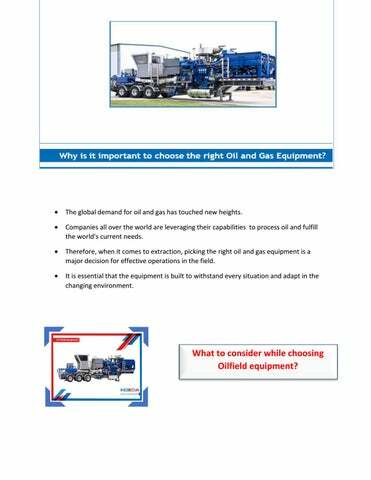 What to consider while choosing Oilfield equipment? Selecting the right equipment is crucial for every company as there are several variants available in the market according to specific needs Both static & rotating equipment are utilized, however, static equipment are preferred all around the world. Make sure that the boiler complementing the oil field equipment is in proper condition, otherwise the steaming process becomes rather obstructive.  A high-quality heat exchanger is an essential component for proper refining of oil and gas.  They are important for separating oil from water and are supported within the cracking units.  Ensure that the heat exchangers can keep material safe in upstream, downstream & midstream environment for higher efficiency.  One of the most important components in the oilfield equipment are valves which are primarily used to control the flow of oil.  Using thermoplastic valves can provide higher sealing capability and allow to better maintain pressure which is at a higher rate.  Apart from these other components like furnaces (used for combustion of solids or liquids) and compressors (flash gas, screw and reciprocating) are also essential for proper refining & processing.  Always ensure that these components are in place and of the right quality for efficient operations. Inox India excels in manufacturing the perfect oil field equipment and oil and gas equipment that facilitate the drilling process and makes it feasible to produce oil and gas. We comply with all the International Standards of safety as we utilize resources in manufacturing, cryogenics, construction, agriculture etc. INOX India has created a wide-ranging portfolio of materials and engineering intellectual property, that include, cryogenic tanks & systems, large ASU SVD projects, cryogenic scientific projects, cryobiological products, LNG vaporizers, disposable cylinders and other Products for OEM’s. Trusted firms like INOX, usually also offer customization services so that the customers can make investments according to their requirements and usage. INOX India is a strong example of expertise in fabrication of critical components, and professional project management. Why is it important to choose the right Oil and Gas Equipment?